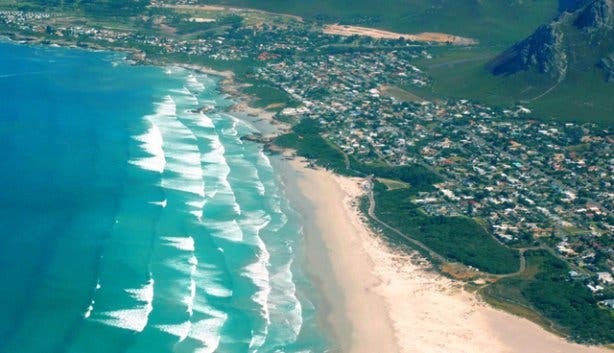 A stunning, wild coastline connects Hermanus’s beaches, where white sand, rocks, grassy terraces, lagoons and rolling waves greet families, couples, surfers and those who want to simply kick back and enjoy the view. A number of benches provide ideal spots for whale watching, while grass terraces are ideal for sunbathers and picnickers who don’t get on with sand. Best for: shelter from the wind makes Voëlklip an ideal spot for surfers. 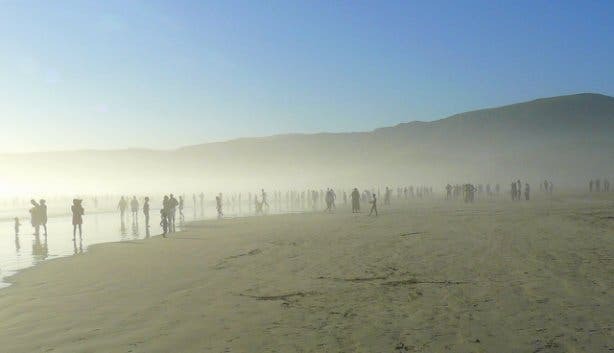 Also known as Nanny’s beach, Kammabaai is popular with young families. 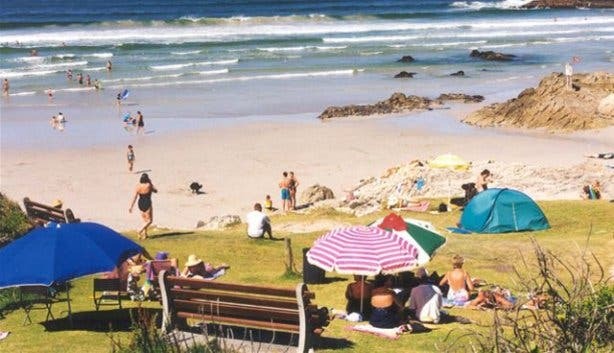 Kids love playing in the rock pools and climbing the rocks; teens love swimming, surfing and body boarding, while mom and dad relax on the grass under the Milkwood trees. The cliff path runs right alongside it, and in fact will take you all the way back to Hermanus which is about 10 km from here. 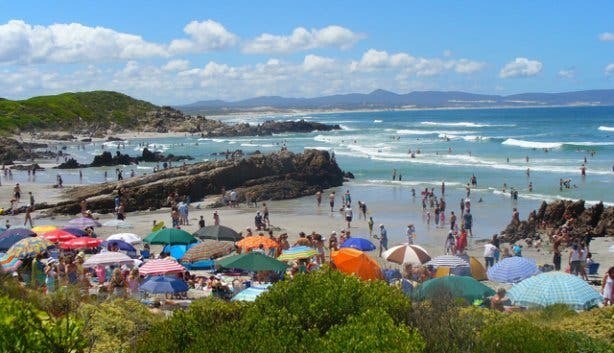 Best for: known as Nanny’s beach, Kammabaai is popular with young families. It’s also a popular spot for surfers. 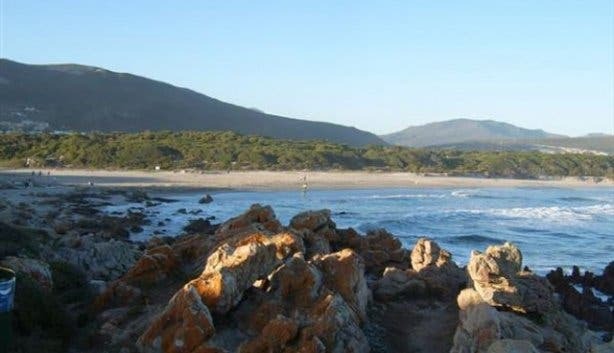 This blue flag beach is widely regarded as one of the most striking in South Africa (it’s also the longest in Hermanus) with rolling waves and a mountainous backdrop. Swim, sunbathe, play beach games or go for a long, romantic walk with your toes sifting the white sand. There’s even a play park for children and a beachside restaurant. Best for: walking the dog. 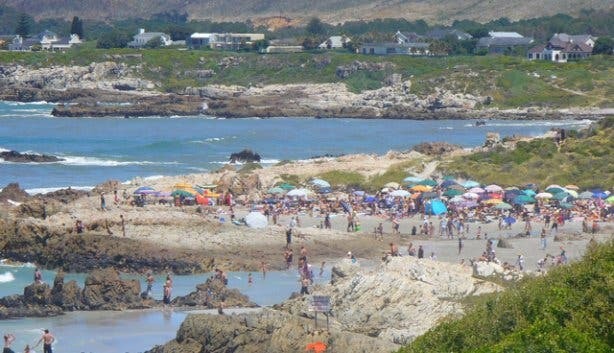 Langbaai (Long Bay) is tiny in comparison with other beaches and surrounding rocky outcrops are ideal for peace and quiet. The private and sheltered beach is accessed by steps, carved out of the rocky cliffs. Best for: swimming and white sand. A shallow river flows from a lagoon, which flanks the beach, where little children splash and play. Onrus is also popular with surfers and body boarders who take advantage of the seas strong currents. The Milkwood Restaurant, which overlooks the beach, has been cited as the best seafood restaurant in Hermanus. Subscribe to our newsletter, like us on Facebook and follow us on Twitter.